The smaller streets and alleys in my neighborhood are known in Thai as soi (pronounced like “soy”). Many of them have no proper footpaths and pedestrians wobble along uneven pavement, avoiding traffic and obstacles as best they can. Around the corner from our condo is a utility pole whose guy wires rise almost invisibly from the concrete, forming a hazard that is hard to see when approached head-on. Recently as I passed by, I noticed that some civic-minded person had tied two plastic bags to the wires at about eye level, increasing their visibility dramatically. This is the sort of MacGyver-like fix that I see frequently. A concrete utility hole cover breaks? Someone will place a stick into the hole with an empty plastic bottle on it as a warning to others. If a truck or bus breaks down on the road, someone will cut a small branch from a tree and stick it in the tailpipe of the vehicle, a green flag indicating the vehicle’s predicament. These sorts of solutions are interesting to see as they seem telling about how Thais approach problems given the limited resources available. 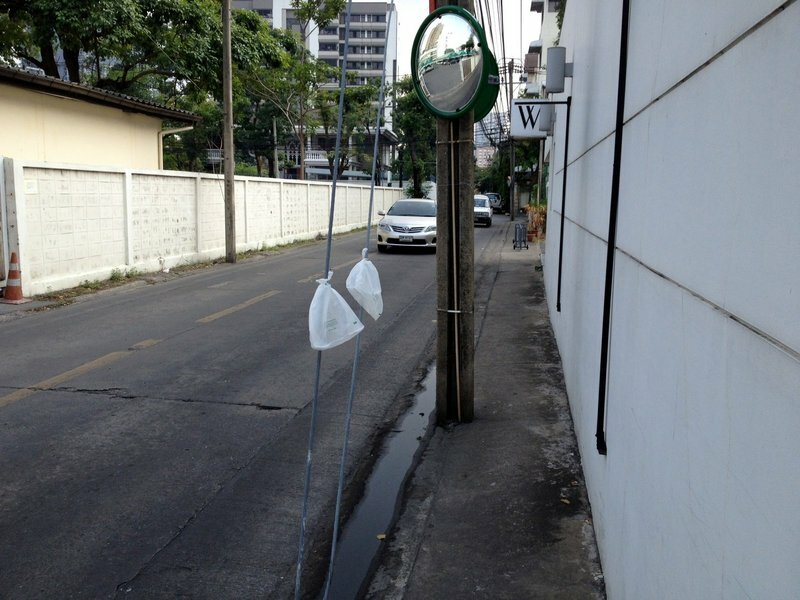 This entry was posted in Uncategorized and tagged Bangkok, culture, problems, signs, solutions, Thailand, warning by christao408. Bookmark the permalink. Hmmm… simple and effective. I like that. I noticed that the other day too. Saw someone also tie a piece of cloth to the wire. Interesting and shoes that the locals apparently know the government won’t do anything to fix it. Simple, practical – here everything is complicated. Really ingenious. I hope the people who tied these plastic bags did so because they wanted to alert before an accident of sorts, and not because they had walked into those wires blindly and got hurt. Either way, it was very nice of them to do that. Necessity is the mother of invention (or inventiveness). That is brilliant. I’m surprised you were able to notice such subtleties. @Devilzgaysianboi – A weird sort of OCD or something, that I notice these types of things. @Wangium – @murisopsis – @ZSA_MD – @greatredwoman – @LostSock21 – @awoolham – My questions, too, is whether the person tied the bags on before or after running into the wire themselves. I ran into it one time, coming home from the market around desk. Fortunately, I saw it at the very last second so just kind of “boinked” into it and wasn’t moving too fast. @Fatcat723 – @ElusiveWords – The more I think about it, I’m considering walking to the hardware store, buying a few lengths of PVC pipe (which is light blue here), split it down the side and put it on the wires. @beowulf222 – I have my list of repairs that one of these days I will take to the district office. At the intersection in the background of the picture, there is a convex mirror that has bis misaligned for a few years now. You are supposed to be able to use it to see traffic coming from around the blind corner. Instead, you can only see yourself! Very thoughtful and creative people! We ARE our brother’s keeper too….at least some of us realize we need to watch out for one another. Now that is an inexpensive, but effective solution.